UP Sahayak Shikshak Syllabus PDF:- The Uttar Pradesh Basic Education Board recently released the UP Assistant Teacher Recruitment 2018-19. Eligible & interested applicants can fill their online application form. Now applicants must require the UP Primary Teacher Written Exam Syllabus PDF. Aspirants also access the UP Assistant Teacher Syllabus & Exam Pattern from here. We have provide below the complete info regarding Exam Pattern, Subject wise Syllabus PDF, Exam Marks and other. 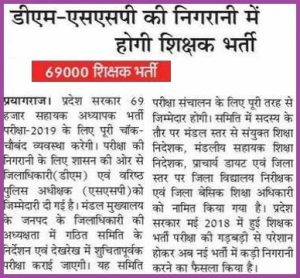 Hello Friends, We have a good news for you, who are preparing the UP 69,000 Assistant Teacher Vacancy 2018-19. Here on this page they are now able to access UP Assistant Teacher Syllabus PDF in Hindi. The Sahayak Teacher Online Form filled from 5th Dec to 20th Dec to recruit the Job Seekers as a Primary Teacher. These posts are vacant from a long time. It is a good opportunity for the candidates who are searching Teacher Job in UP. The recruitment for the Assistant Teacher Notification released. After the submission of the application form, you are require to access the UP Sahayak Shikshak Syllabus 2018 for exam preparation. The UP Assistant Teacher Exam syllabus is important thing if you are going to appear in the examination as it helps the applicants to prepare for the examination. The examination authority UP Basic Education Board all set to disclose the UP Assistant Teacher Syllabus PDF in Hindi. Candidates who have fill their form they are access the UP Primary Teacher Syllabus PDF and start their exam preparation to secure selection in the UP Sahayak Shikshak. As per the news, UP Assistant Teacher Admit Card 2018 released. So stay aware and make continue exam preparation. 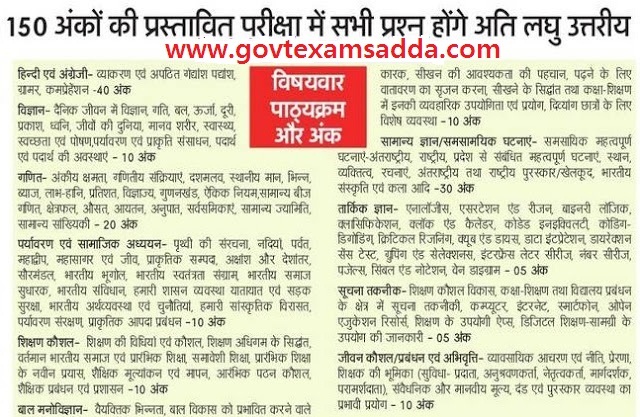 UP Assistant Teacher exam consist various subject in Which Mainly contains General Hindi, English, Sanskrit, Science, Mathematics, GK, Social Science, Information Technology etc. On this page, We have updating the UP Assistant Teacher Syllabus and UP Teacher Exam Pattern, Sahayak Adhyapak Syllabus PDF. Applicants start their exam preparation according Subject wise weightage. By this they can get passing Marks. Minimum 45% marks will be required for General & OBC Candidates & 40% Marks require for reserved category applicants. So We have advised to the aspirants to prepare the Subject wise Exam Preparation also. Applicants who are going to participate in the UP Assistant Teacher 2018-19, Firstly they will become aware of the UP Assistant Teacher Exam Pattern & Marking Scheme also. We have given complete Exam Pattern of UP Assistant Teacher, You can check & access it. There will be total 3 hours provided for the exam. Total 150 Marks exam conducted by the board for assistant teacher. The UP Basic Education Board will be provided a Certificate for all the applicants who have qualify in the exam. All my dear friends, Now download the Exam Syllabus of UP Sahayak Shikshak in Hindi PDF also. This is a big opportunity fr the candidates of UP. Applicants also read the Previous Papers of UP Assistant Teacher. We have provided the UP Assistant Teacher Solved Paper & Model Papers PDF also on this page. The UP Assistant Exam Consist Subjective Type & Single Line answers. If you have any query regarding UP Assistant Teacher Syllabus 2018 then you can comment us.